Post-polish nails are ugly. Here's how to make your digits look pretty again. Q: My nails always get yellow stains on them after I remove dark polish. How can I prevent this and make them white again? A: The reason stains occur on nails in the first place is due to the darker pigments in deeply colored nail polishes that are left on too long without a base coat. "So, the one thing is you should always use when applying nail polish—light or dark—is a base coat," says Fleury Rose, nail pro and Illamasqua nail ambassador. "It creates a barrier that protects the nailbed from staining and also gives your colored polish something to adhere to, so that it stays on longer." To avoid staining, Rose also recommends that when you're removing dark nail polish, don't apply nail polish remover to a tissue and rub in a circle as, "that only pushes the polish into the nail even more. Instead, soak a cotton ball in remover, let it sit on the nailbed for a few seconds, and then apply pressure and drag it toward the tip of your nail, wiping your nail clean of any polish and staining." If you already have a yellow tinge to your nail, lightly buff it using a the soft side of a buffer block, and then squeeze lemon juice onto a cotton pad and rub it over your nail for five to ten seconds. 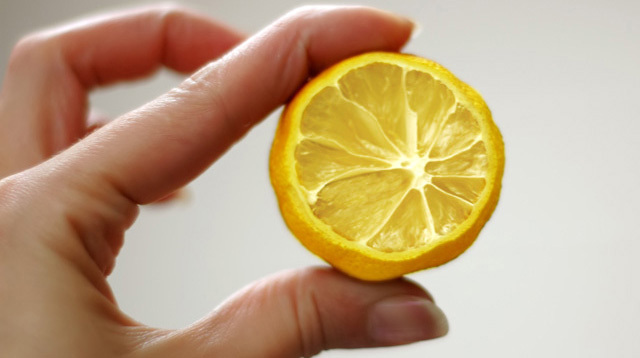 You can also mix two tablespoons of lemon juice into a bowl of warm water and soak your nails to remove any staining. Repeat either method once a week until the yellow-ish tint is gone.